Morning friends! Thank you so much for Abie's birthday wishes yesterday. She is so funny, she wanted to cook dinner for us last night. She's been talking about it for weeks. We're going to take her out this weekend since she cooked last night, plus we had nasty icky weather and once we got home we were NOT getting back out! That's it for me today. Hope you have a fantastic Friday and a wonderful weekend. Thanks so much for stopping by!!!! wow so cute! i am sure all her classmates loved them! Those are wicked cute! You have definitely inspired me to do something similar for my daughter's dance class. Oh my gosh, how cute are those :0) Great idea! Those are such a great idea!! Super cute! Welcome to my little blog! I enjoy making cards, papercrafts and generally anything crafty. I try to be a positive person, love to laugh and be happy because it's just easier that way! 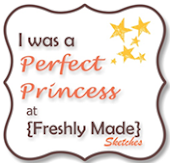 I'm a Perfect Princess from Freshly Made Sketches! I'm in the VIP Club at Casual Fridays! 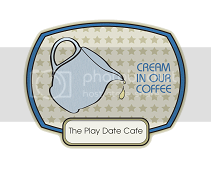 I'm the Cream in the Playdate Cafe's Coffee! All content, is the work of Fourth House on the Right. Look all you want and if for some crazy reason you are inspired by what you see here...I would LOVE to see pictures! Please play nice and don't copy! Thanks for stopping by!